In an election season, where every political party are on alert to not to make any blunder that could harm their party’s image. 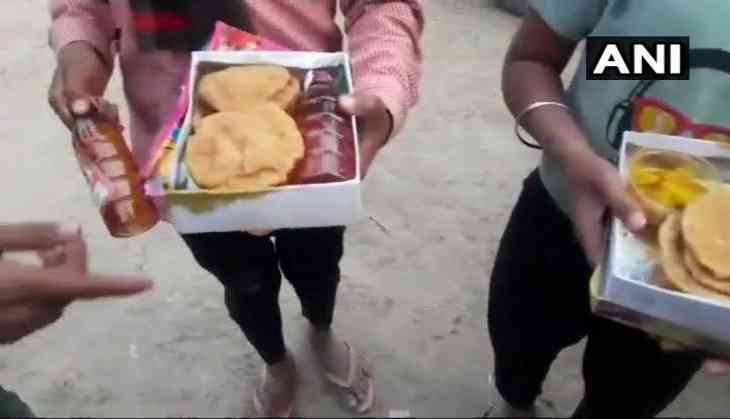 However, recently a BJP lawmaker in Uttar Pradesh’s Hardoi was in the headline after people who have gathered at an event were distributed liquor bottles along with food packets. Reportedly, the lawmaker Nitin Agarwal on Monday organised an event at the Shravana Devi temple in Hardoi, for the local Pasi community. In the event, Naresh Agarwal, the lawmaker's father, who recently jumped to BJP from Samajwadi Party was also present at the event. The BJP Lok Sabha lawmaker Anshul Verma representing Hardoi called the event an ‘unfortunate event.’ Mr Verma told news agency ANI that he will inform the "top leadership" about the distribution of liquor bottles at Nitin Agarwal's event. "To rectify its mistake, the BJP will have to rethink," said Mr Verma. "Naresh Agarwal, who has recently joined the BJP had organised a Pasi sammelan (gathering) at one of our religious places. I will call it an unfortunate incident because it (liquor bottles) was given to the same small children whom we had distributed pens and copies. I will inform the top leadership and write to the excise department about how such large-scale distribution of liquor went unnoticed?" Mr Verma said. In a video, shot by a man present in the event showed that Nitin Agarwal announcing from the stage about lunch boxes being served. Then Agarwal directed the village pradhans to collect the boxes for their respective villages and distribute among them. "All pradhans must go to the place where food is being served... they must take the packets and distribute it among the villagers," Mr Agarwal was heard saying on the microphone. Even some minor boys present in the event, they were also given the food packets. Shockingly, when one of the boys opened the box given to him, it showed how liquor in a plastic bottle was kept on one side along with puri, sabzi and mithai. However, Naresh Agarwal and his son Nitin have not yet made any comment about distributing lunch boxes with liquor bottles at the temple event.